An effective technology leader is a public advocate of the mission-driven use of technology, capable of providing guidance in various aspects of using technologies such as technology plans, professional development, dissemination of pertinent information, and other related responsibilities. This chapter defines technology integration and technology leadership that support the central themes of the book, followed with a synopsis of the issues described in the proceeding chapters. 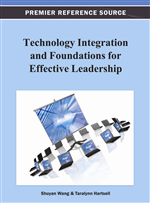 The purpose of this chapter is to introduce readers to the discussions that will emerge throughout the book and link the topics raised back to the central themes of effective technology integration and its leadership. Two main focal areas can be seen throughout this book. These are the ideas of integrating and implementing technology to support the mission of an institution, and the individuals that manage, plan, support, and evaluate such endeavors. Defining these two areas are important for understanding the context discussed throughout the chapters.